Per head cost: 80 Rs. It was the first day of March 2015. Usually, March is the month in which the seasonal transition occurs- winter to summer. But this March was different. This March was historic. Fresh rain showers had washed the whole state of Maharashtra and it was altogether an uncommon phenomenon. We felt as if it was our 'monsoon trek'... 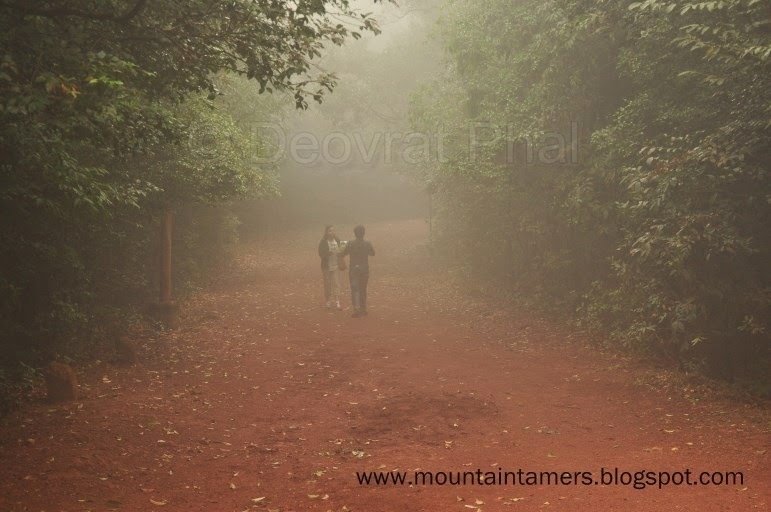 The light drizzle while climbing to One-tree hill from Karjat (कर्जत), the fog-engulfed roads of Matheran (माथेरान) and the golden tree-tops while descending from Sunset point (to धोदाणी village).
" 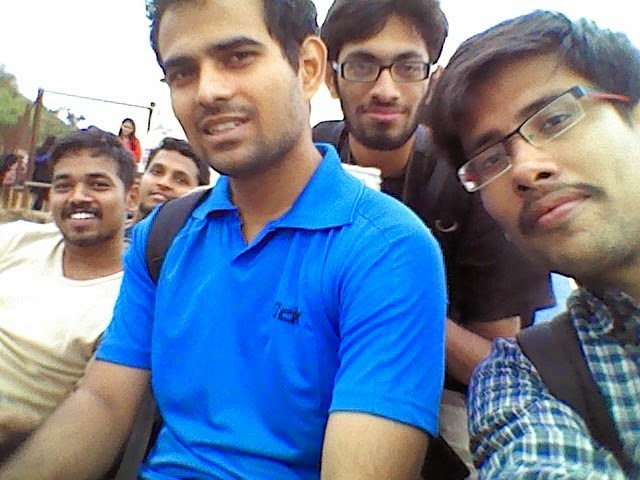 Group consisted of Aaditya Gurav, Abhash Kumar, Ninad Vilankar, Tarun Kaushik and me. This was first trek for Abhash since he shifted to Bhandara "
How to reach: Karjat ST bus stand is at a walkable distance from Karjat railway station. At the bus stand ask for the bus with destination Chowk or Murbad, that goes via Borgaon-bypass or Borgaon-phata (बोरगाव फाटा). The frequency of buses is good and it takes about 15-20 minutes and a fare of 8-10 Rs. Karjat to Borgaon bypass is 7 km and bypass to Ambewadi is another 7 km. For a larger group (>7) private jeep or tum-tum can be arranged from Karjat itself, directly to Ambewadi. We started from Karjat station and reached village Ambewadi (आम्बेवाडी) at the foothills of One-tree hill (Matheran). We started the trek at 8.45 AM. The sky was filled with the Stratus clouds and the odds were that it would rain soon. The memories of Sondai were fresh and it felt like the month of August. 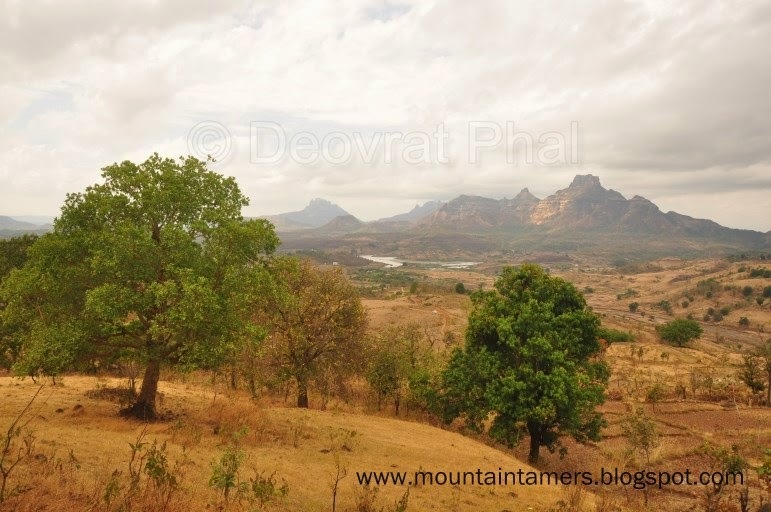 As we took the road to Ambewadi, mountains of Irshalgad, Prabalgad, Sondai started making their presence known. 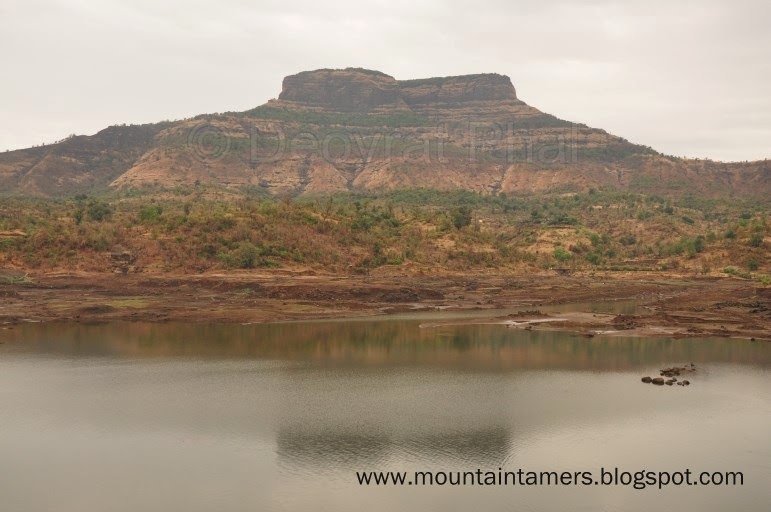 We could also spot the silhouettes of Manikgad and Karnala far off. 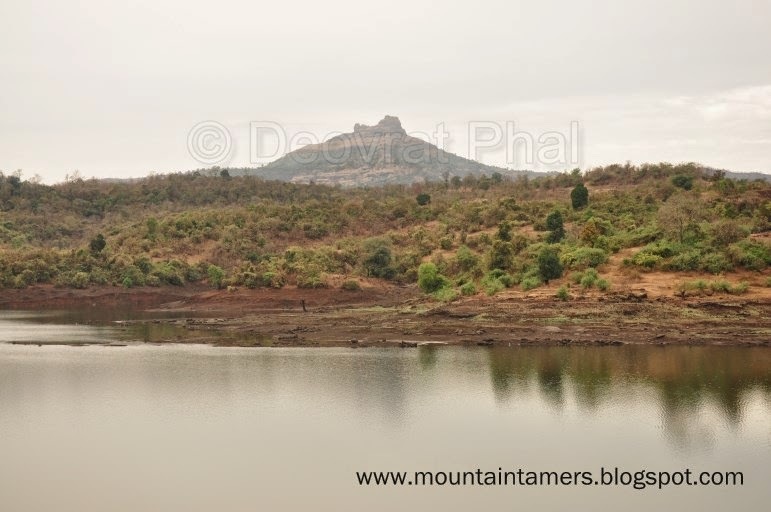 Outline of Manikgad fort is visible. The initial climb is along the ridge and ascends gradually till the first plateau. The trail also enters a small forest cover and ends at the plateau. It had started drizzling by the time we reached the plateau and the clouds turned Nimbostratus. There was a well near the plateau and the water level was above the expected level. We decided to quench our thirst before attempting the last leg of the phase one of our trek. Last part of phase one was a steady climb through the gully. We encountered huge boulders on our way from here. इथे जवळच एक शेंदूर लावलेला मोठा दगड आहे. From here we took twenty minutes to reach the col joining Matheran and One-tree hill. The clock ticked 11.30 AM. We had our lunch here and spent quite a time taking pics of the valley. 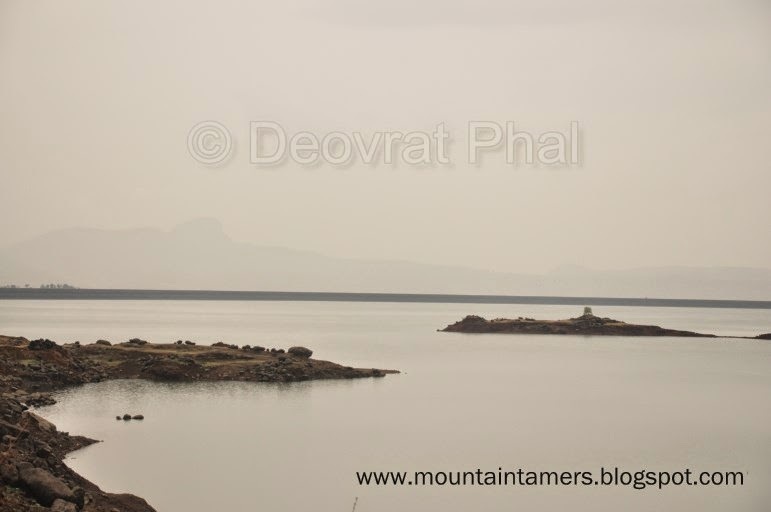 The waters of Morbe Dam looked even more blue and the environment a little bit more greener. 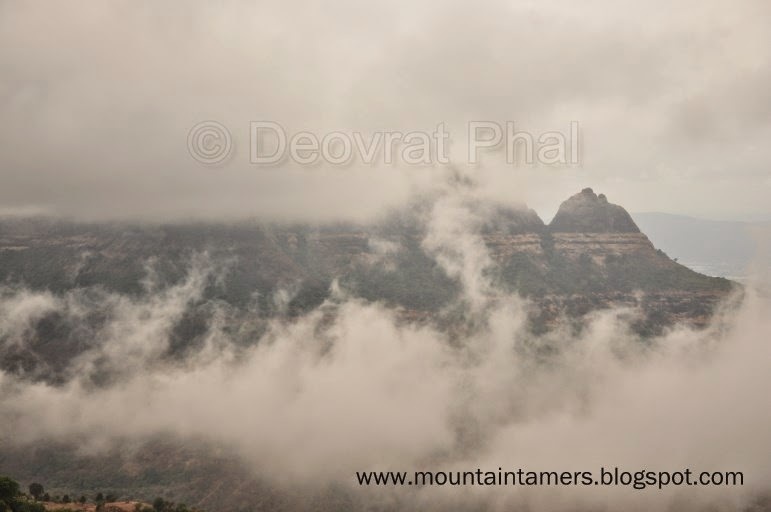 And not to mention the usual chilly intermittent winds- the speciality of Matheran. At about 12.30 PM we left for Matheran. Our next destination was the main market. 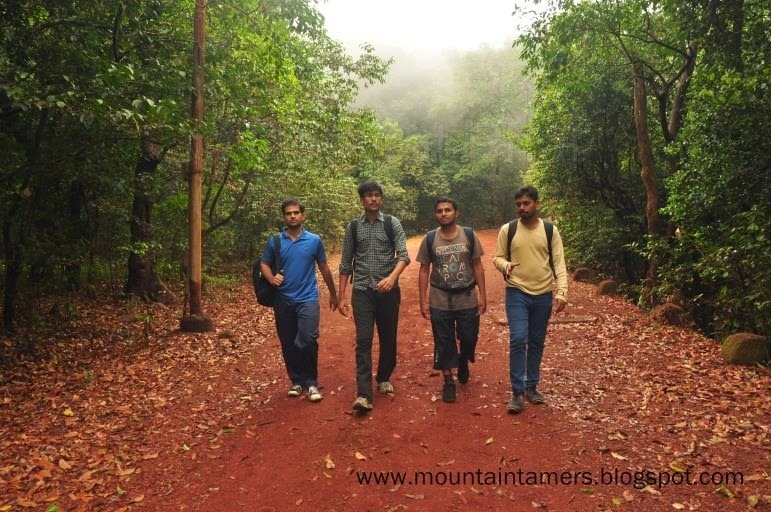 It was indeed our luck that we got to experience Matheran as it is usually during Monsoons. A left turn from the market, taking the uphill trail to our right we started the last part of the second phase i.e. to reach the Sunset point. The trails were very confusing and the only drawback of Matheran is the lack of direction markers. We managed to reach our destination by 1.30 PM. Since the morning we managed to walk non-stop till the One-tree hill, and then till Sunset point. Hence we decided to rest here for some time before attempting the descend to Dodhani. What was meant to be a short break, turned out to be an hour of time-pass. The atmosphere was brilliant. A 360 degree view from here gave us a commanding sights of Prabalgad, Kalavantin Durg, Malang gad, Ganesh-Kartik, Mahismaal, Chanderi, Nakhind, Peb and Matheran (Sunrise point or Panorama point). City of Badlapur was clearly visible. We could even see the part of Arabian sea from here. At 2.30 PM we took off from there. A descend to Dodhani took hardly an hour or so. There's a temple midway. Also you can see the well-stacked hay on the trees near Chinchwadi village (enroute). The flock of white cattle egrets flying on the green background was quite pleasing to watch at. We could hear the crackers and loud celebrations from up here which meant we were nearing our destination. A wedding ceremony had just concluded and the band was waiting for their transport back to the city. A tea stall owner (टपरी वाला) told us to wait for the bus and it should be probably on its way. We had a cutting each (just 5 Rs. with masalaa) as we waited for our ride. After Panvel, usually, everything is pretty much a routine. But what stood out was the fact that we could easily spot the Irshalgad and Karnala pinnacles while crossing the Vashi creek!! Again, thanks to the March rains! !